Candies like taffy, gummy bears, and jellybeans can be very bad for you teeth. These “sticky” candies take a very long time to dissolve and coat your mouth and teeth in sugar. 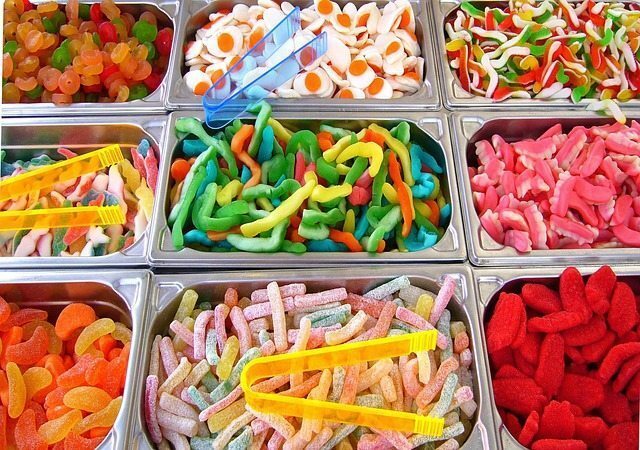 Harmful bacteria then feeds on all this sugar and can erode your teeth and gums. Candies that are both sour and chewy also have acids that can erode teeth along making them a poor choice for your teeth. Soda, sport drinks and sweetened teas are full of both acid and sugar. Because people sip these beverages over longer periods of time, these drinks bathe your teeth in constant layer of acid. Teeth can be exposed for up to 30 minutes at a time to this type of acidification. A study by the University of Iowa showed that after a 25-hour steep in these types of drinks, enamel wear increased substantially. Gatorade, Red Bull and Coke topped the studies’ list of offenders. You may know that citrus is a wonderful source of vitamin C, but it turns out it is not so great for your teeth. The acid in citrus can wear the teeth enamel down, and as a 2008 study showed, grapefruit and lemon juices affect teeth the most, due to their high acidity levels. Do not fear though, as orange juice, by far the popular citrus beverage, is a better option, and some cartons also have added vitamin D and calcium, both of which can actually help your teeth. The vinegar used in pickling everything from sauerkraut, dill pickles and other pickled veggies is chock full of acid as well. Many pickles also have a fair amount sugar added to them as well. Of course most people don’t eat pickles all that often, but over in England a 2004 study showed that eating pickles more the once a day increased the odds of wear on teeth by 85%. So occasional pickles with your sandwich shouldn’t give you concern, but if you find yourself chomping on those sour and sweets all the time, you might want to watch out! Coffee is a stainer. You’re probably already aware of this fact, as who knows how many old mugs have those brownish streaks that just won’t come off. Your teeth are much the same. The staining that coffee does to your teeth can be resistant to brushing too. Those stains can be very sticky as well, which can attract bacteria and food particles. Coffee can be acidic and most people also add sugar, both of which can cause your teeth to suffer. Call 503-536-1839 today to Schedule an Appointment with the Aloha family dentists at Slater Family Dental.